is a full service local deck contractor, specializing in quality decks' building in Ottawa Area (Kanata, Barrhaven, Nepean, Stittsville, Manotick, Richmond, Carp and surroundings). We mainly specialize in building new wood and composite decks of all types and designs. The most popular natural wood options are pressure treated wood and cedar decks. More than 60% of the projects we build are raised decks, elevated from 2 to over 13 ft above ground. 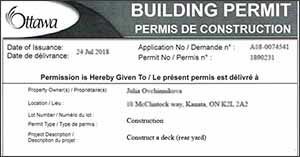 With second story decks building permits are mandatory. Good & safe decks would be considered those which successfully passed all city building inspections and our deck specialists always guarantee 100% compliance with the Ontario Building Code. In our efforts to be one of the best deck companies in Ottawa we also offer all types of deck restorations, including such deck repairs as refinishing decking resurfacing and other deck renovations. There are many deck contractors in Ottawa who do decking replacement, however our deck specialists would offer a complex deck repairs inspection prior to any deck repairs, to make sure that the deck framing, footings and other structural parts are in proper conditions. Being a Local Deck Contractor in Ottawa we value our clients and build small, big decks of simple and interesting designs : high and low decks, backyard decks, screened porches, deck balconies, garden decks, enclosed decks, 2 story decks, floating decks (ground level decks). Choose a varity of great deck designs let our deck experts build one of those beautiful decks for you. As a professional deck builder we work with a wide range of decking materials, and build composite decks, cedar decks, pressure treated wood decks with PTW, Trex composite decking, aluminum railings and lattice privacy screens. As a full service deck builders we offer turnkey deck solutions, from prepairing deck designs, plans, drawings as a part of our deck permits service in Ottawa to building a deck. 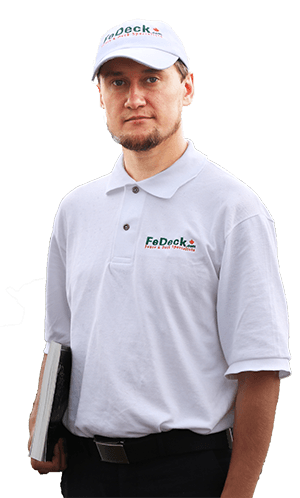 Fe Deck's builders can make your backyard deck ideas come true in time and for a reasonable price. Contact us to learn how Competitive Deck Prices we offer and get free estimate for your backyard deck.